As usual, being the environmental contradiction that I am (sigh), I drove our Jetta Diesel from Montreal and Toronto far too often this summer. If you’ve never done this drive along the 401 — well, you’re lucky. It’s possibly the most boring and monotonous 5 hours you’ll ever spend. I found that the best coping mechanism is listening to audio books to help get through the drive. I have taken the opportunity to listen to a bunch of books I want to read, but would likely take me several months to get through (ie., business books). One of the books I listened to was Confessions of a Radical Industrialist by Ray Anderson. When I looked through my website to see what I’d written about Interface, it turns out not a lot. It’s possible that I overlooked it because the product (carpet tile) and company, are just so ingrained into every eco-designer’s and builder’s psyche, that I just assumed it was like writing about air — everyone knows about it, uses it already, so it would be pointless. But then I’d be wrong. As it turns out, while people inside the green building world are familiar with the company and its founder, Ray Anderson, the majority of people outside the green building world have never even heard of the company, let alone Ray Anderson. In a nutshell, his book is a step by step guide of how one man came to the realization that not only was humankind responsible for climate change, but that his company was part of the problem. He proceeds to describe his goal for his company (complete carbon neutrality by 2020) and how they go about achieving it. Ray’s “aha” moment came to him after reading The Ecology of Commerce by Paul Hawken. Hawken states that not only are companies the main contributor to climate change, but they are also the means that will find solutions and adaptations to climate change. Ray got this message. Then he realized that his company, which makes nylon carpet tiles, was a significant contributor to the pollution mess we’re in. So Ray brought all of his senior executives together in a room one day and told them that he wanted Interface flooring to become a carbon neutral company, and the faster, the better. Needless to say, at first they thought he was nuts — he’d never shown any concern for the environment before. Furthermore, Interface’s product, carpet tiles, is made out of nylon, a 100% petroleum-based product. So how in the world do you become carbon neutral when your product is 100% dependent on petroleum? It’s a question Interface has been dealing with since 1994. The company has set a carbon neutral goal for 2020. That gives them only 26 years to eliminate carbon from their manufacturing process. The company has made great strides in decreasing its carbon content while still providing a great product. Interface has tackled lowering its use of oil in its packaging, office operations, energy for machinery, transportation, etc. It is also finding ways to reduce its waste to zero (as Ray points out numerous times: “There is no ‘away'” — meaning that all waste will go somewhere, if not into new products, then it will end up in landfill and stay there). Right now the company is looking for ways to increase its recycled content and decrease its use of virgin petroleum. It even has a take-back program for old carpet tiles. While Interface primarily deals with commercial and business properties, it does have a line of residential carpet (Flor) as well. If you’re in the market for new carpet, it’s worth looking into, particularly if you lean towards modern tastes. What I really like about this book is that Ray has “seen the light”. Because he is not seen as a radical, treehugger-hippie, but rather as a businessman at the top of his company, he can direct his employees to do what it takes to decrease the company’s carbon and water footprint. And, because he is so determined to achieve carbon-neutral status, his employees bring him ideas that would be nixed before they reached senior management in most other companies. Ray gives the example of one of their factories in California. There was a proposal to put solar panels on the roof of a manufacturing building. The panels would generate a small amount of the plant’s electricity needs and cost $1.2 million. Even as I was listening, I was shaking my head thinking the cost was ridiculous vis a vis the output of electricity. But Ray told them to go ahead. Why? Because it was the right thing to do. The marketing department at Interface produced an astounding campaign around the solar panels because they ended up powering one of the carpet machines providing it with 100% renewable electricity. The product that came off that machine became a major success, more than justifying the cost of the solar panels. Huh. Who’d have thought a $1.2 million investment could have made that much of a difference. And that’s the point. Ray was a leader in every sense of the word. When he asked for something to be done it was done, even if his employees might have been skeptical at first. He was willing to take risks (sometimes they didn’t pay off, but that didn’t stop him), and he remained convinced that decreasing Interface’s carbon footprint was the best business decision he’d made. It increased the company’s efficiency, decreased its waste and water use, lowered its expenses in other areas and helped make it a leader in flooring in the commercial world. Because Ray got it, and because he was the head of the company, the sustainable directive filtered down through the organization. If employees didn’t agree with him they would either have kept it to themselves or looked for other work. But it also allowed his organization to hire innovative thinkers and people who wanted to work for a company that was striving to make the carpeting world a better place. However — and this is a big however — a company’s sustainability goals will not be easily achieved where the CEO doesn’t have Ray’s “aha” moment. Unfortunately most captains of industry find the task of transforming their company into “Sustainable Company 2.0” too daunting to even begin to look at and if the leaders aren’t convinced that decreasing their carbon, water and waste footprint is important, the company will never succeed in achieving sustainability. The pressure needs to come from the top. Sadly, Ray Anderson passed away earlier this year. While his legacy and mandate continue on at Interface Flooring, his influence and sustainability leadership within the business community is greatly missed. Hopefully, other business leaders will take up his gauntlet and continue his mission towards carbon neutrality within their own companies. For more information on Interface Flooring’s sustainability efforts, visit the website. To see the FLOR products (residential carpet tiles), see here. When we renovated our house in 2002, we tore up many square yards of 1970s chocolate-brown carpet that had seen better days. In 2002, there was no other place for it but landfill. Carpet may not seem like a big deal in the grand scheme of the waste stream, but consider this: 6.5 billion pounds of used carpet are torn up every year and comprises 4% of all landfill — enough to cover Prince Edward Island, every year. Because synthetic carpet it is made of plastic, ALL of the synthetic carpet that has ever been made and discarded is still sitting in landfill — plastic takes between 500-1000 years to degrade. Furthermore, because synthetic carpet is made out of plastic, it is a recyclable product can be reused as a feed stock for making new items out of plastic. In fact, for every yard of carpet that is recycled, 0.5 gallons of oil is saved. So maybe that doesn’t seem like a lot, but imagine if we could divert all of the carpet annually from landfill, we’d avoid using billions of gallons of crude oil and avoid emitting its equivalent greenhouse gases every year. Aspera Recycling has teamed up with The Rosedale Group, a large Canadian logistics company, to recycle old carpet that would otherwise go straight to landfill. The program targets carpet retailers, architects and designers, carpet installers and even homeowners. Further, while there are other carpet recyclers out there, Aspera sorts every part of the carpet so that it can be converted into plastic pellets ready to be reused for new plastic products. While currently Aspera focuses solely on sorting and separating the different parts of the carpet, Scott Grantham, Territory Manager for Aspera, told me that in 6-9 months Aspera plans to have a fully integrated processing plant which will convert the sorted material into plastic pellets ready for reuse. In fact, recycling the carpet makes the process completely closed loop, reduces the need to little or no new crude oil in the manufacturing process. Currently, a pilot project has been launched in Ontario with the program set to go nationwide in a few months. There is a cost associated with participation in the program, depending on the area in which a company is working, or the volume of carpet a company works with, sometimes it can be either cost neutral or a less than tipping fees associated with carpet dumping. For more information on the program, or to see how you can participate, visit Aspera Recycling’s website. If you’re a homeowner and are about to purchase new carpet, ask your retailer if it participates in a recycling program. All Home Depot locations across Ontario. If there is one carpet company that saw the sustainability writing on the wall, it has to be Interface and its family of companies. Way back in 1994, Ray Anderson, Interface’s visionary leader, realized that the way most companies do business was not sustainable in the long run. 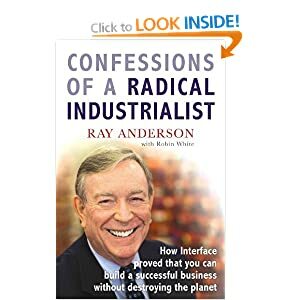 In fact, Ray was so convinced that he wrote a book, Confessions of a Radical Industrialist: Profits, People, Purpose — Doing Business by Respecting the Earth and put into practice what he preached. The idea he put forward is that by working with nature, instead of depleting natural resources faster than they can be replenished, you can make money and maintain the earth’s natural resources at the same time. Interface is now the largest carpet tile manufacturer in the world. Carpet tiles alone are more environmentally friendly than broadloom because of the ability to replace a few tiles instead of an entire carpet if specific spots are worn from high traffic, or one spot is irreversibly stained. Up until 2003, Interface targeted the corporate and commercial industry from malls to corporate offices. In 2003 Interface launched a new residential line of carpet tiles called Flor. Flor carpet tiles are available in two different materials: recycled nylon or 100% wool (a blend of New Zealand and British wools). Interface takes its environmental commitment seriously. In addition to creating a product that’s good for your health, it also is aiming to make carpets made exclusively from renewable and recycled products that is 100% recyclable. While it isn’t there yet, it’s well on its way. Right now Flor is made from 100% New Zealand and British wool, old pop bottles (polyester carpet tiles), and recycled nylon. Further in its manufacturing process, Interface aims to have all of its manufacturing facilities run on renewable energy from solar, wind and landfill gas. Right now they have a pilot program in place in the LaGrange, GA plant whereby methane gas from the local landfill site is piped to the factory and converted into energy. At the carpet’s end of life Interface will take it back through its “Return and Recycle Program,” deconstruct it into its backing and top material to recycle it into new carpet tiles. This process means that carpets avoid landfill completely. If you check out the Flor website you’ll see that you can design your own carpet pattern. It can be shipped directly to you, or you can check out the dealers listed below if you’d like to see what carpet tiles look like before ordering.